1. Chop tomato and green chillies. Keep aside. 2. Heat oil in a pan and add green chillies, garlic, tamarind, roasted ground nut, sesame seeds, chopped tomatoes, little salt one by one and fry them. Cover the lid and cook for 10-15 minutes in low to medium heat. Remove from heat, let it cool. 3. Grind step 2 into fine paste. Don’t add water. 4. Season it with mustard, urad dal and curry leaves. 5. 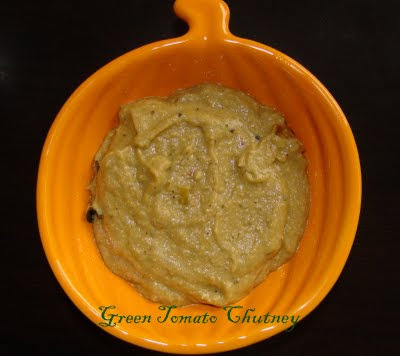 Green Tomato chutney is ready to serve. I tried this yesterday, it was really good. I havenot added Tamarind and Sugar.. Yeah..It tastes good. You can also try the same recipe with red tomatoes.